!!! Beam Me Up, Scotty... Uh, Geordi... Uh, Chief O'Brien... Somebody,Beam Me The "Frak" Up... Oh, Wrong Show (Star Trek TNG News) !!! I'll see your Battlestar and raise you a Q!?! Don't get me wrong I liked it but I don't know if I was in love with it. Then came the second season and I found myself thinking the same thing, "good episode here and there but not a consistent hit. Apparently, I was not the only person to feel this way. The ratings those first two seasons were nothing to write home about. But something happened during the third season that transcends popular culture and rockets a mediocre series into another dimension. Can I put my finger on exactly when it happened? Well, most people will tell you that it was a two part episode (Best of Both Worlds) that changed all the rules, but I don't know. Season three was just better and we finally had a Star Trek we could call our own. It left the shadow of Kirk, Spock, and McCoy and it became it's own animal. It became the Star Trek that I will show my son when he's ready. It became the Trek of my generation (see what I did there?). I love the old guys (original) and I love that series, but I came in after the fact and I couldn't call it mine. I couldn't own it, not that I would be pretentious enough to dictate what any Star Trek creator can do, but TNG was something I could say that I was apart of. I was there from the beginning and I stuck with it all the way through. I can honestly say I miss that series and the 24th century as a whole. I want more if that. I want more men with bald heads and British accents (that didn't sound right). I want more TNG . It is with that statement that I can say that, for a brief moment this past April, I got my wish. 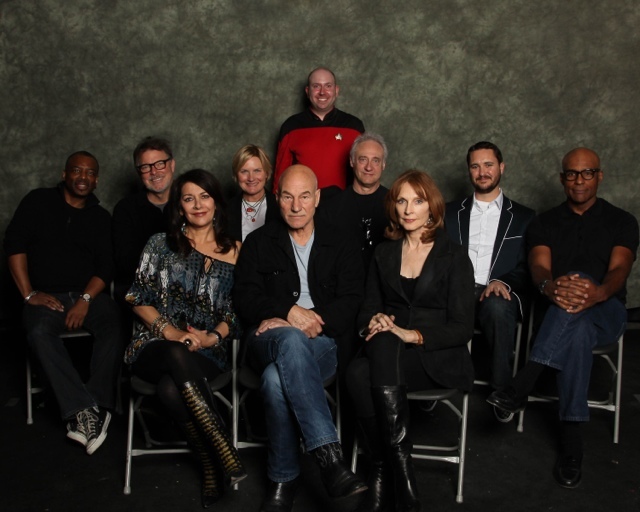 For the 25th Anniversary of Star Trek: The Next Generation, all of the principle cast united (in a federation, if you will) onstage at the Calgary Expo for one evening. 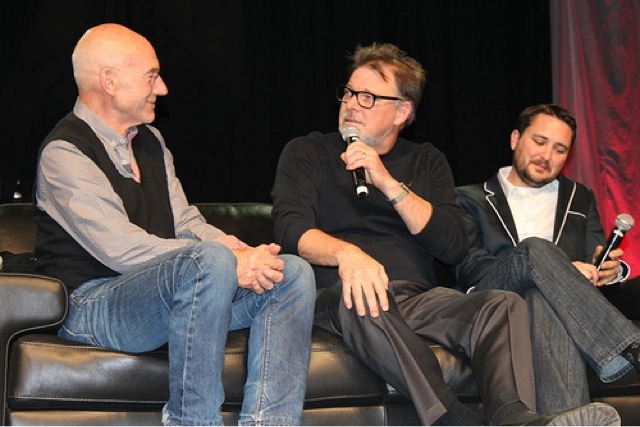 They told stories, they shared laughs, and they reminded everyone why they should still be doing Star Trek after all these years. Even Wesley Crusher was there (we all love Will Wheaton)!! From everything I've read or heard about that night, it makes me envious of all those who were in attendance. These people like each other and they aren't petty like some ensemble casts can be (I'm looking at you "Saved by the Bell"). There were also special guests in attendance (Q) and other stars of Sci Fi television who took the mike to ask questions (after all they are fans too). I had almost forgotten that this was taking place until I came across this "article" at High-Def Digest. If you are a fan go check this out, though remember that it does carry a PG-13 rating (those TNGers are saucy). Also remember that you can pick up TNG in all of it's Hi-Def glory on July 24th (ha ha, that Paramount sure is funny) when the first season gets released on Blu-Ray. Go, spend, and tell "the powers that be" that you want more TNG. It's sad that we don't have a Star Trek television show to enjoy week in week out, so go and let your voice be heard anyway you can. WE WANT TREK ON TV!!! Just Do It. Why do I hear Arnold Schwarzenegger voice when I read that last sentence? Yeah, I'm weird. And check out the picture of the entire crew in this article, Picard looks ticked off and there is a goofy guy in a Starfleet uniform, classic!! Todd "Set Phasers To Kill" B. Posted on June 18, 2012 by Todd Blanchard and tagged 24th century Blu Ray Blu-ray Kirk McCoy Michael Jackson Q Spock Star Trek TNG The Next Generation Wesley Crusher Will Wheaton.